Herd Health - We offer testing for Johne's in ruminants, as well as annual Brucellosis and Tuberculosis testing. We perform calfhood vaccinations (Brucellosis), routine deworming, and vaccinations of cattle for IBR/BVD/BRSV/PI3 (shipping fever), Leptospirosis, H. somnus, and Clostridia (blackleg), and write health papers on animals we have examined. 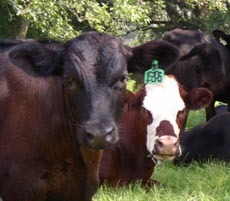 Reproductive exams for pregnancy or breeding are available for cattle and horses, and bull testing is also available. Please contact us to develop a vaccination and herd health program tailored for your specific needs. Click here for our list of links to some excellent articles on management. Wellness exams - We pull blood for Coggins tests and can perform basic prepurchase exams on horses. We provide EEE/WEE/Tetanus/Flu/Rhino, West Nile Virus, Rabies, and Streptococcus equi (Strangles) vaccinations, and have a variety of dewormers available. Please click here for a more complete description of our equine services. Surgery - We perform routine surgical castrations of cattle and horses, float teeth, remove growths and repair lacerations, and insert microchips. Sickness exams - Our coverage includes treatment of medically manageable colic, laminitis (founder), choke, trauma, downer cows, dystocias (calving/foaling problems), c-sections in cattle, and several other conditions. We can also discuss preventative management you can implement to minimize the chances of some of these conditions.